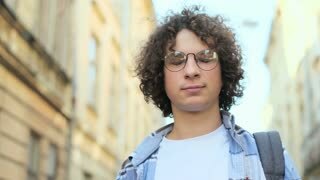 Search Results for "happy students smiling"
Portrait of happy cute curly hipster. Caucasian teenager man wearing eyegalsses smiling in city. Europe. Slow Motion. Student, urban concept. Four cheerful students riding bicycles in park. Group of happy smiling friends cycling outdoors, aerial view. Happy summer vacation. Young cheerful friends taking a video with monopod. Happy smiling cyclists waving with hands while taking selfie. 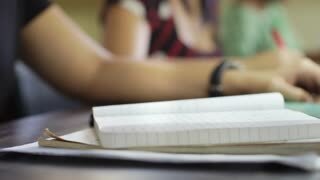 Active summer vacation of students. Group of happy smiling students on campus as people pass in foreground. 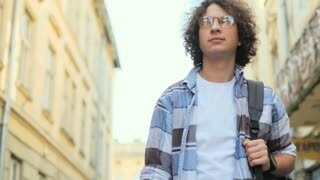 Portrait shot of smiling and laughing handsome curly young man wearing eyeglasses walking on street of old town center in europe at sunlight, looking at camera. Student, urban concept. Three Confident Young People Students Scatter Paper and Rejoice Success, Smiling and Laughing, Standing of Business Center Outdoors in Neutral Colors.